Revenue by the Customs Department in 2018 rose by €20.4 million over 2017, and the biggest driver of the increase was the importation of materials for the construction industry. The department said on Wednesday that its revenue last year was €447,399,157. Although there was a slight decrease in import duties, income from excise duties saw an increase of €10.5 million over 2017, with a sharp spike in excise duty pertaining to construction items and materials. VAT collected by the Customs Department on behalf of the VAT Department during 2018 also increased by nearly €12.5 million. 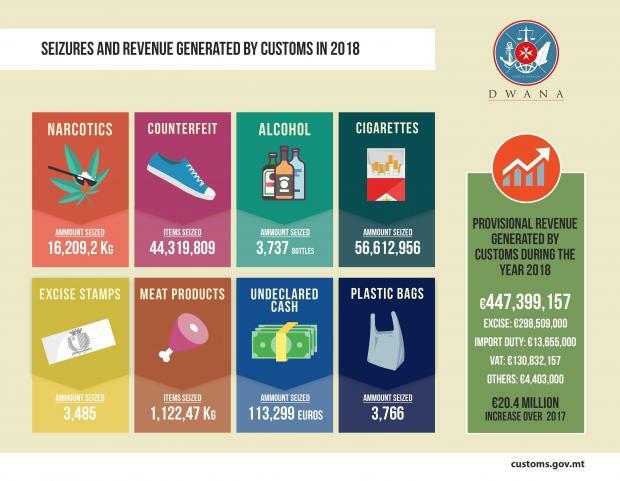 Customs inspectors last year also seized a record amount of illegal items including 56,612,956 contraband cigarettes and 16,209,2kgs of narcotics. During the year the department introduced a new canine unit and commissioned new scanning equipment at the Freeport. It also beefed up its human resources complement and increased the number of enforcement operations in a bid to curb illegal excise-goods importation.